It seems that the British Parliament almost lost the interest in Indian education between 1854 and 1902, and as a result, the education could not secure liberal and ever-increasing grant. In 1882, however, the Indian Education Commission was appointed by the orders of the Central Government, but it procured no sound result. The population of British India was about 200 million in 1882, in which at 15% the number of school-going children was hardly 300 lacs. It is also remarkable that in 1882, only 1.17% of funds were used by the Municipalities of Bombay from its income. Thus, the Aga Khan II came forward to open The Khoja Ismaili School for the first time at Bombay and elsewhere in 1882. It was perhaps a veritable beginning of a renaissance in Indian Ismaili community, whose tradition is continued upto now in the world. The Aga Khan II also generated his close contact with the Ismaili communities in Upper Oxus districts, Badakhshan, Samarkand, Burma and East Africa. The growing prosperity of the Ismailis and his own towering position, earned his prestige among the Muslim population of India. He promoted educational and philanthropic institutions for the Indian Muslims with the cooperation of a certain Rahimtullah Muhammad Sayani, a most enlightened member of the community. He spared no pains in raising the social status of his followers. Destitute members of the community received generous help from time to time at his hands. It must be remembered on this juncture that Abdul Hadi bin Abdul Attash (1320-1383), whose kunya was Jamiyal Shah with the titles, Aqa and Datar, known as Aqa Jamiyal Shah Datar, was an eminent Sufi saint in India. He mostly preached the Hindus in Girnar at Junagadh. He is said to have retired in the mountain of Girnar, known as the "Mount Datar" (datar'no pahad). He converted a large number of the Hindus of the Aghori tribe. His shrine is located in Junagadh, which is visited by the Muslims and Hindus. It is said that a group of the Ismailis also venerated the saint and visited his shrine. During his visit to Junagadh in 1882 after assuming the Imamate, the Aga Khan II had warned his followers not to visit the shrine of Jamiyal Shah, saying that there was no Aqa (Lord) and Datar (Bestower) on earth except the Imam of the Age. Since then, the Aga Khan II is also called as Aqa Ali Shah Datar (Lord Ali Shah, the Bestower) in the Ismaili orbits. The Aga Khan II used to visit interior Sind, notably in district Thatta. He liked the climate of Karachi, where he lived in Honeymoon Lodge, lying on the hill near the railway workshop, called Honeymoon Hall. It was bought by the British India in 1859 on the account of the Kolahpur State as a residence for Cheema Saheb, the former Raja of Kolahpur. The government sold it to Mr. Noonan in 1860, and he afterwards sold it to the Aga Khan I, who used it as his residence, known as tekari (hill). After his marriage with Lady Ali Shah in 1867, the Aga Khan II moved to Karachi most probably in 1871-72, where his son and successor was born in 1877. The Aga Khan also built a palace for his another residence at Karachi in garden zone, known as pir'ji wadi (the fertile tract of the pir), which was converted to Aga Khan Gymkhana in 1940 by the Aga Khan III. The palace faced the park, then known as Government Garden, and later it came to be known as Mahatama Gandhi Garden. He sought permission from Heavy Napier Bruce Erskine, the Commissioner in Sind (1879 to 1887) to build a gate of the park in 1882. The Aga Khan II bore its cost, where an existing plate indicates the donation of the space for the gate by him. Like his father, the Aga Khan II was closely associated with the Nimatullahi Sufi order. Before going to India, he had generated close ties with Rahmat Ali Shah, the head of the Nimatullahis, who had been the guest of the Aga Khan I in Mahallat in 1249/1833. Subsequently, the Aga Khan II maintained his relation with Rehmat Ali Shah (d. 1278/1861). He also maintained relations with Munawwar Ali Shah (d. 1301/1884), the uncle and the successor of Rehmat Ali Shah. The Aga Khan II also entertained several notable Iranian Nimatullahis in Bombay, including Rehmat Ali's son, Muhammad Masum Shirazi, Naib al-Sadr (d. 1344/1926), the author of the "Tara'iq al-Haqa'iq", who visited Bombay in 1298/1881 and stayed with the Aga Khan for one year. 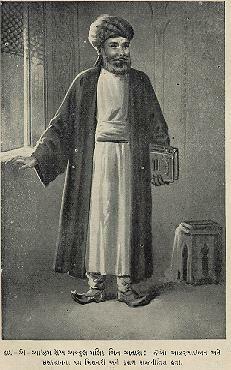 Safi Ali Shah (d. 1316/1898), an eminent Nimatullahi also enjoyed the Aga Khan's hospitality in 1280/1863. The Aga Khan II had wedded with Marium Sultana in Iraq, who died at Bombay after leaving behind two sons, Pir Shihabuddin Shah (1268-1302/1851-1885) and Aga Nur Shah (1272-1302/1855-1885). These two sons had been brought up in Hasanabad at Bombay. Aga Nur Shah, aged 30 years, was a good sportsman. He once fell down from his horse while riding, and sustained serious injuries, which proved fatal, and his death took place three months before the death of his elder brother. The Aga Khan II had appointed his elder son, Pir Shihabuddin Shah as a pir on 1299/1882. He was a learned scholar, a good philosopher, and is best known for his piety. He died at the age of 33 years on December 15, 1885 due to chest disease at Poona, and was buried at Karbala. "On the day he heard of the death of my elder half-brother, Aga Shihabuddin Shah," says the Aga Khan III while recollecting his memory of childhood, "my father was terribly shaken and , though he tried to hold his own, as a man in his position would do, so great was his grief that I think it led to his early death a few weeks later. I honestly believe that it was the death of my two half-brothers that brought about my father's end when he was apparently in good health." For his further biography, the readers may refer "Pir Shahabu'd-Din Shah al-Husayni" (cf. "The Great Ismaili Heroes", Karachi, 1973, pp. 100-1) by Mumtaz Ali Tajddin Sadik Ali. The second wife of the Aga Khan II belonged to a Shirazi family, and after her death, the third marriage was solemnised with Shamsul Mulk Lady Ali Shah, the mother of the Aga Khan III. The Aga Khan II was a skillful rider and great sportsman. He was very fond of hunting, but never made use of shelters in the hunting field for big game. Standing exposed to danger he took a sure and steady aim at wild animals. In this way he had bagged no less than forty tigers.